Although the vast majority of homeless men, women, and children in NYC sleep in shelters, the thousands of others who bed down on the streets or in the subways are a daily, visible reminder that our city is in the midst of a record homelessness crisis. This week, the City’s Department of Homeless Services announced the results of their annual Homeless Outreach Population Estimate (HOPE) survey, which estimated that 3,892 homeless people were sleeping on the streets on a single night in February 2017, up 40 percent from a year earlier. The Coalition for the Homeless has long expressed concerns with the HOPE survey’s methodology – such as its failure to include people sleeping in private vestibules or non-visible locations – and so the estimate almost certainly understates the total number of homeless New Yorkers staying on the streets. Nevertheless, the severity of the ongoing crisis is unmistakable and underscores the urgent need for permanent supportive housing to help our most vulnerable neighbors obtain the stability and dignity of a home. As WCBS 880’s Rich Lamb reported, Giselle Routhier of the Coalition for the Homeless said it is what New Yorkers have been seeing. She adds the city and state need to up their games. “Both the mayor and the governor have made commitments to supportive housing and that’s what we need now to come on as quickly as possible,” Routhier said. 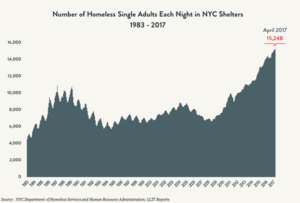 In an article for Gothamist, Emma Whitford wrote about HOPE’s methodological flaws and the difficulty reaching homeless youth, and Erin Durkin of the New York Daily News wrote that the estimate is higher now than at any time since 2005.